Are you lost when it comes to LinkedIn? Are you looking for a way to make meaningful connections to build your podcast? This week’s episode of Should I Start a Podcast is what you’ve been waiting for. 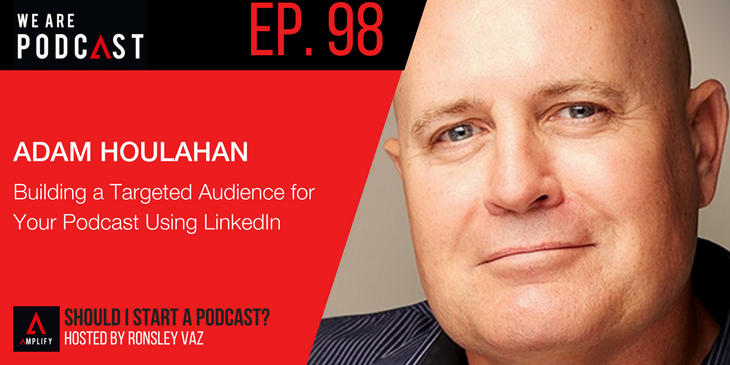 We have LinkedIn master Adam Houlahan on deck with his keynote speech he gave at We Are Podcast 2015. Adam has the #1 searched LinkedIn profile in Australia, with thousands of connections. He’s the bestselling author of The LinkedIn Playbook, Social Media Secret Sauce and Better Business, Better Life, Better World. Adam shares with us the top three things you can do right now to vastly improve your LinkedIn profile. He shares strategies to build both an audience platform for your podcast as well as ways to reach out to guests across the social media network. Nice article,I agree with your content, LinkedIn, has reported that it now has more than 575 million members worldwide.